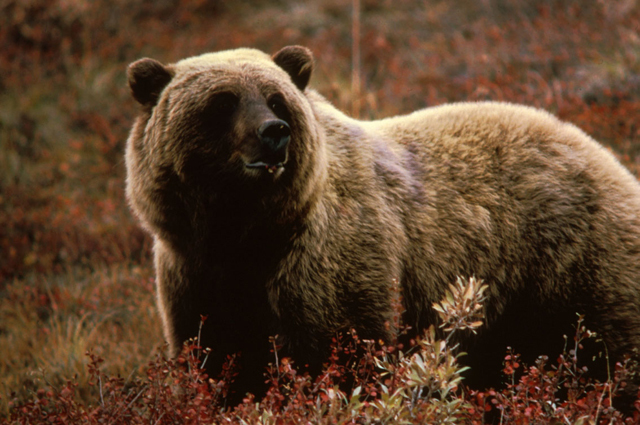 Last year was a bad year for grizzly attacks in the U.S. Much has been written about the tragic incidents that took the lives of four men: two in Yellowstone National Park and two others in the Gallatin National Forest in Montana and the Shoshone National Forest in Wyoming. A quick review of those and other bear attacks can be found at Wikipedia’s List_of_fatal_bear_attacks_in_North_America. It’s sobering to read. Outdoor enthusiasts all across the Web have since written bundles about the best way to deal with a grizzly confrontation while out on a hike or a hunt. Some say guns, others say pepper spray. Do you play dead or attack back? There are lots of questions and lots of opinions. One of the most authoritative online sources for advice and information I have found is by Yellowstone National Park and The National Park Service called: Your Safety in Bear Country. If you plan to visit grizzly country this summer, take a look and browse the topics and videos there. The outcome for you and or your friends and loved ones could well depend on it. This entry was posted in Uncategorized and tagged Bears, Camping, Grizzly Bears, Hiking, Hunting, National Parks, Paddling, Pepper Spray, Yellowstone National Park. Bookmark the permalink. Howard, the link posted doesn’t work for me. Is there another? Gail: Thanks for the heads-up. Try them again. They should work now..